Research led by Kuhan Chandru and Jim Cleaves from the Earth-Life Science Institute at Tokyo Institute of Technology, Japan, has shown that reactions of alpha-hydroxy acids, similar to the alpha-amino acids that make up modern proteins, form large polymers easily under conditions presumed prevalent on early Earth. These alpha-hydroxy acid polymers may have aided in the formation of living systems on early Earth. There are multiple theories for how life first formed on early Earth. One popular theory suggests that life may have arisen in specialized environments, such as tide pools or shallow water hot springs, where simple chemical reactions would have helped generate life's precursors. All life is made up of polymers, large molecules made up of a sequence of molecules called monomers. A key question is how biological polymers could have formed without enzymes on early Earth. While environments of early Earth might have had monomers that could give rise to life, it would have been difficult for polymers to arise from these without the help of enzymes. In this case, the team showed these polymers could have formed with alpha-hydroxy acids before the existence of enzymes on early Earth. 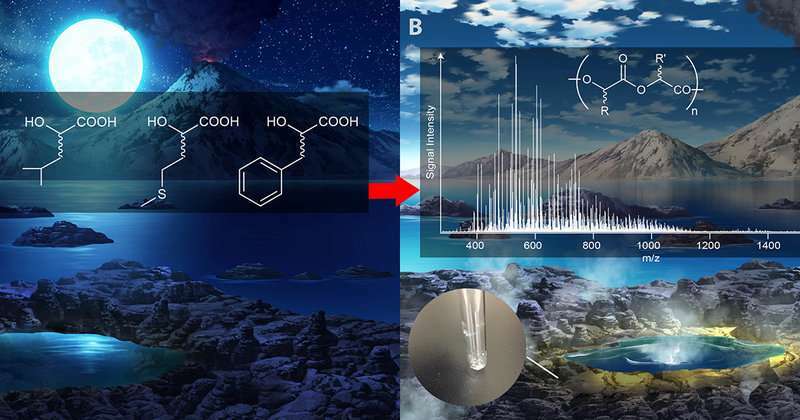 This multi-national team showed that hydroxy acids polymerize more easily than amino acids, and that they could have provided the necessary toolkit to kick-start the formation of more complex molecules for the origin of life on Earth. To simulate various primitive environments, the team reacted alpha hydroxy acids under varied conditions of pH and temperature, from room temperature to boiling hot. Using sophisticated high-resolution mass spectrometry and data analysis software, they showed that these polymers can form over a range of conditions. The team showed further, that using a mixture of different types of alpha-hydroxy acid that they could form huge numbers of types of polymers, in effect creating vast 'libraries' of different chemical structures, which can remain stable over a range of environmental conditions. The work culminated with the creation of a polyester library made up of five kinds of alpha hydroxy acids (Figure 1). They showed that this simple-to-create library could contain hundreds of trillions of distinct polymer sequences. This research opens new areas of exploration of the chemistry that may have led to the formation of life. The authors are keen to extend this work by investigating the types of functions of alpha-hydroxy acid polymers might be able to carry out, and other types of simple chemicals that could interact with these, possibly leading to self-replicating chemical systems.